The Nottingham tram network after a major extension. Note: The route designations HT and PC are for clarity only. They are not used by the operator. First-generation electric tramway: 17 Nov. 1900 - 6 Sept. 1936. Revived tramway (Nottingham Express Transit): 9 March 2004 - today. Tramway (First-generation tramway): ? mm. Nottingham Express Transit: 1435 mm. "Bringing Nottingham together", Tramways & Urban Transit, Special Supplement, Nov. 2015 (78: 935), 30p. "Nottingham Express Transit - Light rail operator of the year" Tramways & Urban Transit, June 2008 (71: 846), p.225-232. 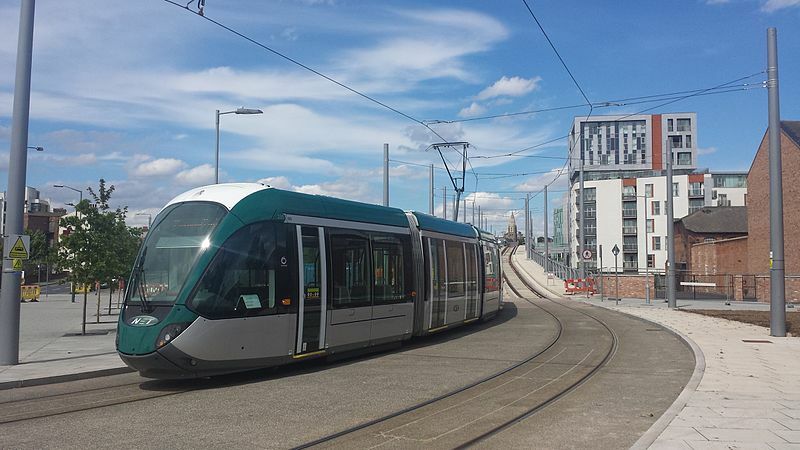 "Nottingham: First tram is almost ready to roll", Tramways & Urban Transit, Sept. 2002 (65: 777), p.329-332. Rossiter, W. "Wider impacts on NET Phase Two", Tramways & Urban Transit, Sept. 2016 (79: 945), 347-349.